To reduce drying time, blot (don’t rub) wet hair with a microfiber towel (I like the wrap hair towels you can find at Bed Bath and Beyond). Work in a multi-use product that will detangle and smooth your hair – Keune’s 2Phase Spray is a MUST for condition and heat protection. This will speed up the drying process which makes this one of the best styling tips for those with long or super thick hair. 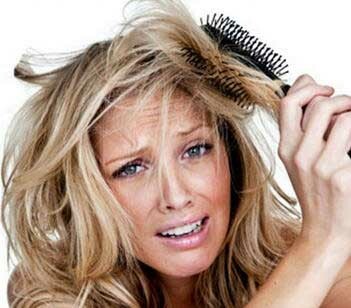 Dry your hair with your fingers and your blow dryer until it is about 90% dry. Then use a brush with the blow dryer to style and finish up. Add volume. When your hair is dry, take dry shampoo or Keune’s Volume Powder and use it under your hair at your crown. For the dry shampoo, rub it back out after with a towel. Focus around the crown of the hair to revive volume. Put your hair up in a messy bun. Styling tips like this require no accuracy. If you want lift on top, first flip your head upside down and as soon as you come up pull the top of your hair up and secure with bobby pins. Then, gather your hair at the nape of your neck and wrap with elastic, then loop the tail into the bun and secure. Pull a few strands above the elastic to add lift and secure with bobby pins. Revive your hair quickly by just flipping your part to the other side. It will help give a bounce to your hair. This is one of the easiest styling tips out there. If you wake up late and have bed head, consider a braid. A braid holds well with your hair’s own oils. To prevent frizz from happening, you should let your hair air dry whenever possible. Then, put hair products on your hair while it is still damp. If you get up in the morning and don’t wash your hair, then put hairspray on a brush and lightly run over your hair to tame the frizz. A large soft makeup powder brush actually works best for this technique. For flat hair, wash hair with a lightweight shampoo and follow up with a light conditioner. Towel-dry hair, then apply a volumizing root lift from the roots to the mid-shaft of your hair. For a natural look, set your hairdryer on high heat, low speed, and dry hair completely, plumping it with your fingers as you go. Or consider using a dry, sprinkle-on volumizer like Keune Volumizing Powder. Put your hair up in a scarf. Use a scarf as a headband to give your hair a pop of style. Check with your hairstylist on products and other styling tips that can help you streamline your daily routine.